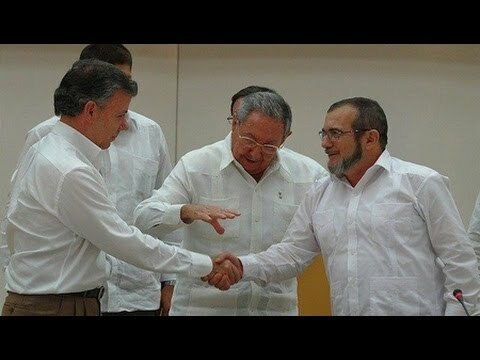 On Wednesday the Colombian President Juan Manuel Santos met with Rodrigo Londoño, the leader of FARC, the Revolutionary Armed Forces of Colombia. They met in Havana over a peace agreement brokered by the Cubans that is currently underway. This breakthrough comes after 51 years of insurgency and will address rights and abuses and the compensation for victims. Here to discuss all of this is Joshua Large. He is a professor of international relations at the Universidad de EAFIT in Medellin, Colombia. Thank you for joining me, Joshua. PERIES: So Joshua, a very curious FARC leader tweeted, let’s join efforts to achieve peace. Are they really serious and enthusiastic about all of this? LARGE: Serious, yes. How enthusiastic they are is open to question. But I think they don’t have any choice, and I think that’s what’s different about this particular set of negotiations from prior ones, is that FARC has been placed in a position where they know that they have absolutely no chance of winning a military victory. They’ve abandoned that course of action. And so the only realistic option left open to them is negotiation. PERIES: Joshua, this Cuban-brokered agreement so far is not the first time, as you said, there’s been other attempts. So for example, Uribe himself and then President Chavez made an attempt to bring the two sides together. What’s different about this one? LARGE: Well in fact, the case of Chavez is not unique. There have been several other attempts to negotiate with the FARC, going back some time. And I think this one is really different because, partly what I just mentioned, about the weakness of the FARC, and the fact that they don’t have any other serious option. But also I would say that the government is in a different mode, if you like. And although there is serious dissent, which has perhaps been overplayed in Colombia, on the part of Colombian elites, we know for instance that former President Álvaro Uribe has been very vocal in his opposition to the peace process. I think to some degree that masks the reality to which the majority of Colombian elites, including many members of Uribe’s party and perhaps even Uribe himself, because Uribe in 2009 himself tried to contact the FARC and possibly worked for hammering out a deal. So I would say that there is broad institutional support on the part of Colombian elites for a deal as well. And for that reason, and I think it has a lot to do with economics and the perceived necessity for Colombia to attract foreign direct investment, tourism, et cetera, and the idea that a peace deal will underwrite that sort of development, that there is a strong collective will on the part of Colombian elites as well. PERIES: And Joshua, so let’s break down what’s in the agreement to be negotiated over the next six months. LARGE: Okay. So the agreement includes several components, four of which have at least in principle been dealt with. The first is land reform or land restitution. The second is political participation on the part of the FARC. The third is the issue of drug trafficking and the FARC’s [mode] of participation in drug trafficking. And the fourth, which is the one that we’ve just seen come out yesterday, is this question of transitional justice. So then the remaining two which need to be dealt with are essentially how to implement all of this. Because while in principle these things have agreed on, the details have yet to be ironed out. And also disarmament, FARC will have to give up its arms in order to be a party to whatever agreement is made. And then of course after all of that is done it has to be ratified by Colombian public vote. LARGE: Transitional justice meaning some provision for members of the FARC to either be granted amnesty, and it’s estimated that some 15,000 members, rank and file members of the FARC, will indeed be granted amnesty out of this deal. And on the other hand, for those who are deemed culpable in some sense for massacres, war crimes, et cetera, or whatever may be deemed a more significant crime, that they will undergo some judicial process. And essentially a separate judicial process is being set up which will involve some international legal experts in conjunction with an historical memory commission, which will seek to process the worst offenders on the part of the FARC as well as the armed forces, because they are also party to this deal. And those who supposedly admit their guilt will be given a deal which will amount to something like community service and house arrest for five to eight years. Those who don’t and are nonetheless found guilty will be subject to up to 20 years in prison. PERIES: Now, this has been a very sticky point in the past and is in the current negotiations. This means people who were involved in FARC pleading guilty. Now, will that same measure be applied to the military of the Colombian government? LARGE: Well in theory, yes. But that’s of course the big question, whether or not it will. And I can tell you, for instance, that one of the members of the government negotiating team, General Mora, who is the former head of the Colombian armed forces, has been very vocal about the fact that Colombian military personnel should not suffer according to this deal. And there’s certainly a lot of resistance on the part of, let’s say middle class Colombian society, that members of the armed forces should serve jail time. So I would suspect that there will be some element of Colombian officialdom serving time, some members of the Colombian armed forces, but that it will probably be relatively few. PERIES: Joshua, the drug traffickers are favoring this agreement. Why? LARGE: Well, there’s some suggestion that because the FARC has long been involved in the drugs trafficking business, at least via taxing coca production, that in areas that they still hold–and although they don’t hold the vast swathes of Colombian territory that they did before, beyond [inaud.] Colombia they still hold substantial territories in southern Colombia, for instance, in the Putomayo region. And so there is some suggestion that if the FARC were eliminated from this picture that this would of course open up territory which could be exploited by other, what is called BACRIM in Colombia, that is essentially criminal bands emerging, or post-paramilitary groups that emerged out of the right wing opposition to FARC. And groups like the Urabeños or Rastrojos, would certainly lick their chops at the prospect of getting ahold of more territory. PERIES: And another curious thing about all of this is the World Bank and the IMF has come out supporting this peace agreement and the process, which seemed very interesting. Why is that happening? LARGE: Well, I think in that sense this all has to be seen in light of Colombia’s neoliberal growth model. The fact that this is an export-driven economy, and that the nature of those exports have also changed somewhat. Up until the end of the 1980s Colombia was a big coffee exporting country, and it still exports a lot of country. But two-thirds of its exports are fossil fuels. Oil or coal. So that’s a huge part of the Colombian economy, and it needs more foreign directive investment in order to grow. So both form the standpoint of Colombian oil industry and international elites interested in being involved in the Colombian oil sector, a peace deal would be helpful. You can also say that in terms of attracting foreign investment there’s no question that the signing of a deal would at least supply a kind of image boost for Colombia, which the country desperately seeks. And it’s important to mention, however, on that score that notwithstanding all of the hoopla surrounding the new Colombia and the notion that the country has turned over a new leaf, Colombia remains an extremely dangerous place. And there are over 6 million people displaced in this country, second only to Syria in the world. And it’s estimated that something like 150,000 people were displaced in 2014. So these processes still continue. And so in some ways–. PERIES: And this displacement is largely due to the trafficking and FARC combined? LARGE: No, this displacement is largely due to right wing paramilitary, or now what you might call post-paramilitary, groups in conjunction, sometimes with the Colombian army, and with large landowners. What it essentially is is an enclosure process whereby peasant lands are taken forcibly or by threat and concentrated for the production of large agricultural cash crops, like most famously palm oil, but for instance soy, or other industries like cattle ranching. So this has led to a huge land concentration. And in that sense you could say that the conflict in many ways has been served by the civil war. Because it has again enabled these paramilitary groups working in conjunction with the state to expand capitalist agriculture. But I think what we may be seeing now is a phase where that is largely being consolidated. And so even in the sense of agriculture, which may have benefited from the conflict, on the whole Colombia would benefit, at least from the perspective of this neoliberal growth model, from a peace deal which would increase tourism, increase foreign direct investment, and especially help in the hydrocarbons industry. PERIES: All in the interest of another neoliberal model. PERIES: Joshua Large, thank you so much for joining us today. LARGE: Thanks very much, it was a pleasure.